In the field of IT recruitment, a question often arises over which channels are the most relevant for candidates. Which channels do you use to reach suitable candidates? In this article, you will learn how multi-channel posting can help you achieve better results in IT recruitment. Today, posting ads should be relatively easy for you. The time of annoying approval processes is long gone. With a modern recruitment marketing software, you can easily connect your IDs from framework contracts, connect individual job boards and generate your own tracking URLs, which also allows LinkedIn or Facebook to link to postings. Only then is it guaranteed that all data from all channels will be collected and evaluated in your system. Multi-channel posting is defined as the one-time creation of a job advertisement and the subsequent posting in several channels at the same time, for example job boards, a career page, an employment office, Google AdWords, newsletters, and job alerts. In other words, it involves marketing a job advertisement on as many channels as possible. It offers the possibility to use different channels easily. The more relevant clicks you get, the more applications you will receive. However, only the relevant clicks will help you. Otherwise, the clicks won't lead to applications. Avoid the black box method. 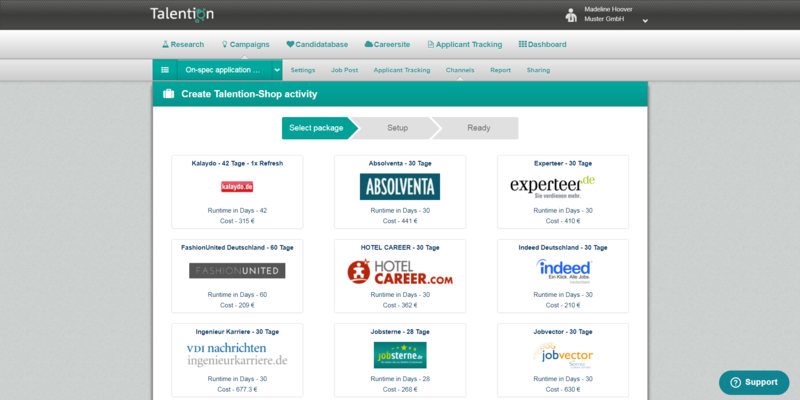 By utilizing that method, the job ad will be displayed on a huge number of job boards with just one click. This process sounds promising at first. However, you can't track which job sites the job ad is shown on. It is important to know where the qualitative applications are coming from. You shouldn't blindly post on multiple job boards, but rather analyze the success of each job market. Evaluating the channels where you are posting jobs is the only way to know which channels have brought qualitative applicants and are worthwhile for future recruitment. If you don't evaluate the channels, you won't build up any know-how and start from scratch with every new recruitment.